A comedy series with Jack Warner as Joe and Kathleen Harrison as Ethel. It ran from 1953-61 and was a spin-off from the cinema's popular comedy drama of 1947, Holiday Camp, which had introduced the salt-of-the-earth Huggett Family. Vera Day (in the picture above) was the second of six actresses to play their nubile daughter Jane. She had been preceded by Joan Dowling from the 1953 first series. Valerie Jene was the third Jane from 1954-1955 and was followed by Marian Collins, Cynthia Bizeray and Alanna Boyce. I really enjoyed playing the part of Jane and only gave it up when I got married in early December 1955 and went to live in New York the same month. The lovely actor, Kenneth Connor always made us laugh with his antics. One day he arrived in the studio wearing flippers and when my then fiancé came to pick me up wearing a rather pale pink shirt, Ken said he looked like a tin of grade three salmon!! 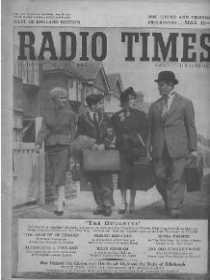 I am in Spain at the moment but do have a newspaper cutting of a photo of the four Huggetts at my London home. I will try to get it copied and sent to you, but it is in a pretty fragile state. I don't know if this is of any interest to you, but I also played the part of Violet Elizabeth in Just William when I was a child, both on radio and stage. This would have been around 1946-1947 and also live outside broadcasts as an early teenager interviewing people - in particular the ice-skater Belita and flood victims who had lost their homes. I think this would have been around 1948.